During our trip to Napa last Thanksgiving weekend, we scheduled a tasting at Gary and Suzanne Wooten’s. During the tasting, Gary pulled the cork on his 2006 Smith Wooten Syrah. At that time, Gary informed us this will be his last Syrah. He told us the Syrah grape is just not as popular as the Cabernet Sauvignon. Chris was bummed that this was the case and of course immediately bought some of the 2006 Syrah; it’s in our cellar getting happier every day! One night we decided to have cod and a salad for dinner. I was trying to think about what to have with the white cod fish. Now most people would think a Sauvignon Blanc or a white wine would pair great with the cod. As for myself, I believe in drinking what you like – with whatever you eat! 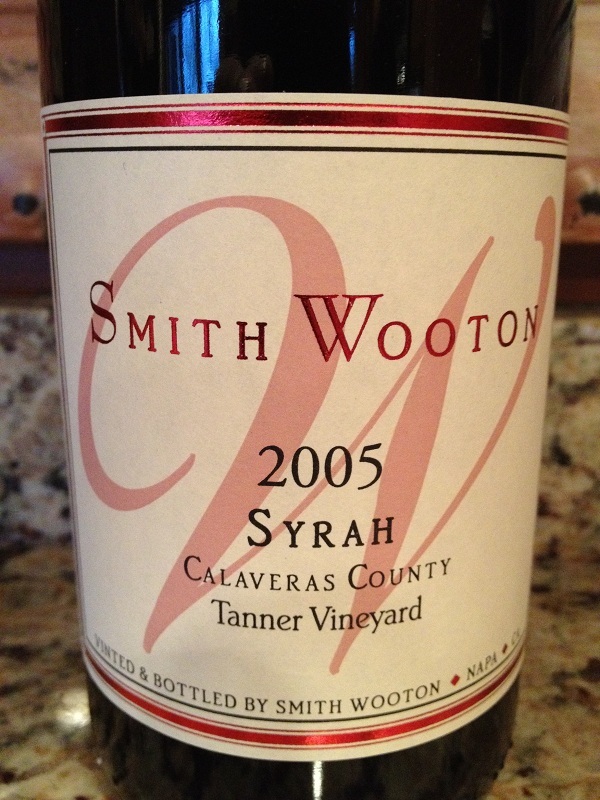 We had a few bottles of the 2005 Syrah so I grabbed one and brought it up. As soon as Chris saw the bottle her face lit up and she smiled. 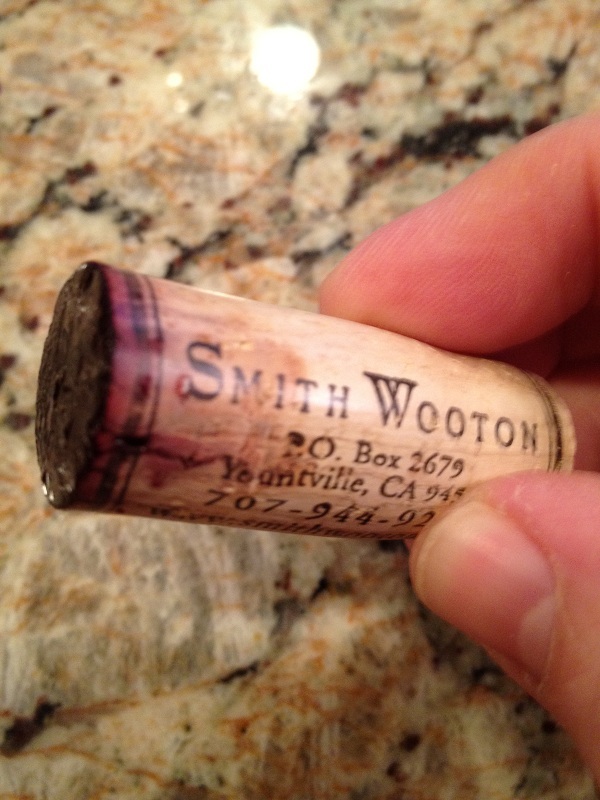 As I pulled the cork I noticed it was showing its age. 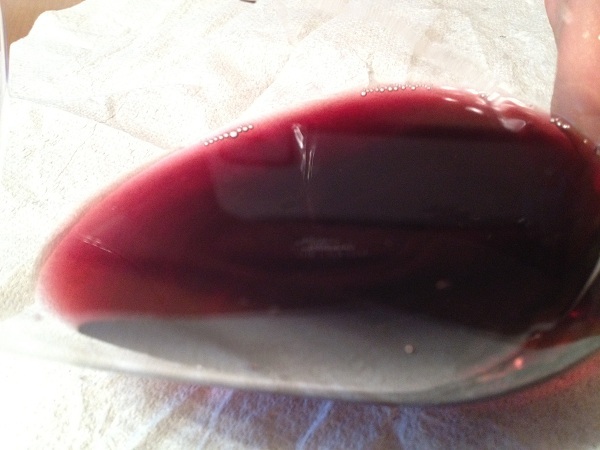 The cork was still pretty rigid so it could still sit in the cellar for some time, not today, though…. It was time to pour some wine in the glass and give it a try. Viewing it, I noticed it had a very nice color to it. The edge of the wine was somewhat clear. When I started to smell the wine in the glass, there were hints of Red Cherry, and maybe a hint of Blue Berry? It also had a light smell of caramel. Tasting the wine the tannins were very light. 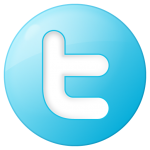 I felt the tannins on the edges of my tongue and I could feel them in the back part of the roof of my mouth. It was very soft and easy to drink. I was impressed by how long the finish was. The wine was very easy to drink. I think some of my friends who don’t even drink wine would agree this was a good, easy to drink wine. 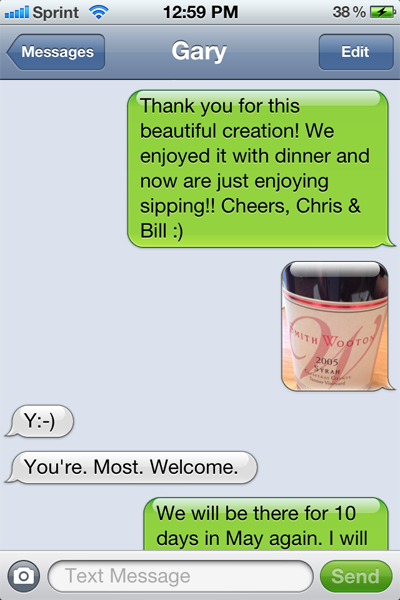 As we were sitting on the couch finishing our glass of wine, Chris decided to send Gary a text of our dinner and his bottle. Chris tells Gary “Thank you for this beautiful creation!”. It was only moments later Gary was texting Chris back. They texted back and forth for a while about the wine and seeing Gary and Suzanne in May. We are looking forward to seeing them both again. And, maybe Chris will cook us all dinner? Rating this wine, I would give it three full glasses and Chris would give it a four or five! It’s one of her favorite Syrah’s.